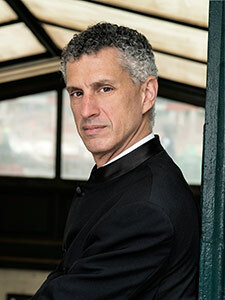 Award-winning conductor Robert Franz is the Music Director of the Windsor Symphony Orchestra and the Fairbanks Summer Arts Festival Orchestra, and is also Associate Conductor of the Houston Symphony. Franz’s appeal as a first-rate conductor is acclaimed by critics and composers. In increasing demand as a guest conductor, Franz’s recent appearances include The Cleveland Orchestra, the Baltimore, St. Louis and Victoria Symphonies and the Orchestra da Camera Fiorentina in Italy. This season also includes guest conducting appearances with the Winston-Salem Symphony, the Reno Chamber Orchestra and Opera Idaho. An award-winning educator, he founded and co-directed the inaugural season of the Idaho Orchestra Institute in 2017. In his fifth season as Windsor Symphony’s Music Director, Franz continues to extend the number of subscription weeks. Known for galvanizing audiences and communities alike, he has developed collaborations with the Windsor International Film Festival in a presentation of Joan of Arc, the Art Gallery of Windsor, the Canadian Historical Aviation Association, The University of Windsor and St. Clair College. Upcoming programming includes his innovative project to bring together members of youth orchestras from Windsor, Detroit, and Guanajuato, Mexico, for a series of workshops and performances. As Associate Conductor of the Houston Symphony, Franz was recently honored as the first member of the Symphony conducting staff with the Raphael Fliegel Award for Visionary Leadership. It was presented to Franz in recognition of his immense success in advancing the organization’s educational and community engagement activities. He continues to lead the Symphony in a broad range of creative educational and family concerts, including its summer neighborhood concert series, an outreach program dedicated to bringing music to all of Houston’s communities. During his tenure, attendance at family and educational concerts has almost doubled. Franz marks his eighth year as Fairbanks Summer Arts Festival Orchestra Music Director by directing the festival orchestra and mentoring aspiring conductors. In past years, he has brought the orchestra to Denali National Park and Preserve in a performance that marked the first time an orchestra had performed there. ASCAP has recognized Franz on two occasions for his advocacy in arts education. Under his direction, both the Buffalo Philharmonic Orchestra and the Louisville Orchestra were awarded the Leonard Bernstein Award for Educational Programming.